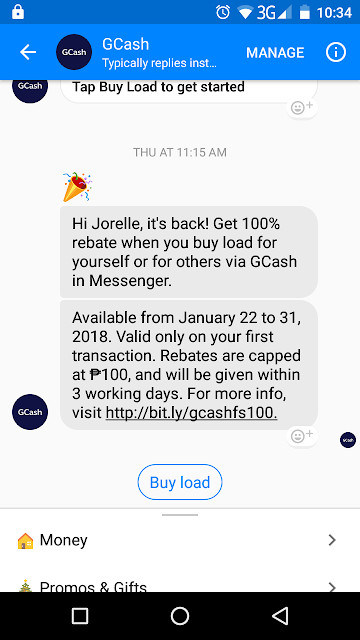 Dropped like a Hatputito: GCash | 100% Rebate is Back This 2018! My post about GCash Messenger's 100% Rebate on Buy load option last December 15, 2017 is back this January! You can check out my previous post >>here<<. It is valid only on your first transaction and rebate will be given within 3 working days. The promo is available from January 22 to 31, 2018. As per experience, they offered this promo twice last December and since opotunista ako, I availed both promos. Tee-hee! Good to know they have this promo again this January.